As I get more and more into the electronic music and DJ world, I find that sites like djtechtools.com write a lot about being a producer and making your own music. 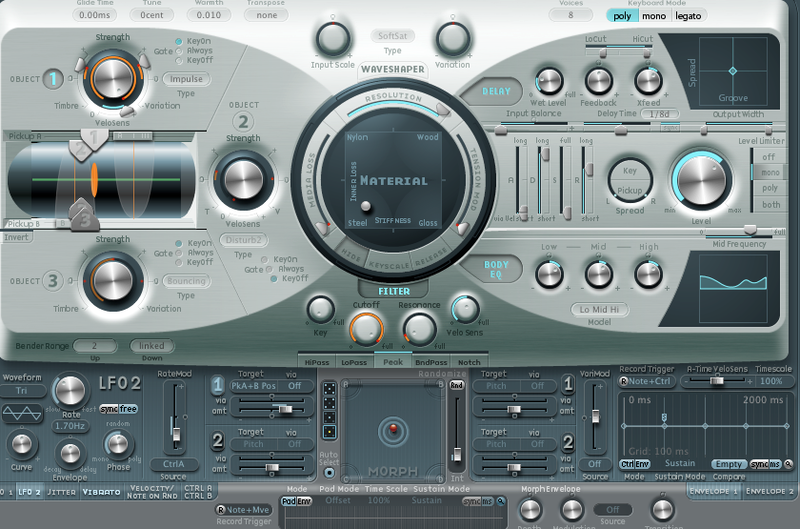 There are a huge amount of excellent software synthesizers out there, ranging from the free plugins in Logic and Ableton to paid ones like Massive and Absynth from Native Instruments. I’ve never been a big fan of presets, mostly because of not wanting to have sounds like anyone else; so I spent an obscene amount of hours learning the ins and outs of each soft synth that I had. What I found was, every synth basically follows the same principles in the way that they are designed and knowing how one works can lead you to figure out another one. So, I decided to simplify the learning process and teach you how to understand any soft synth and build your own sounds. 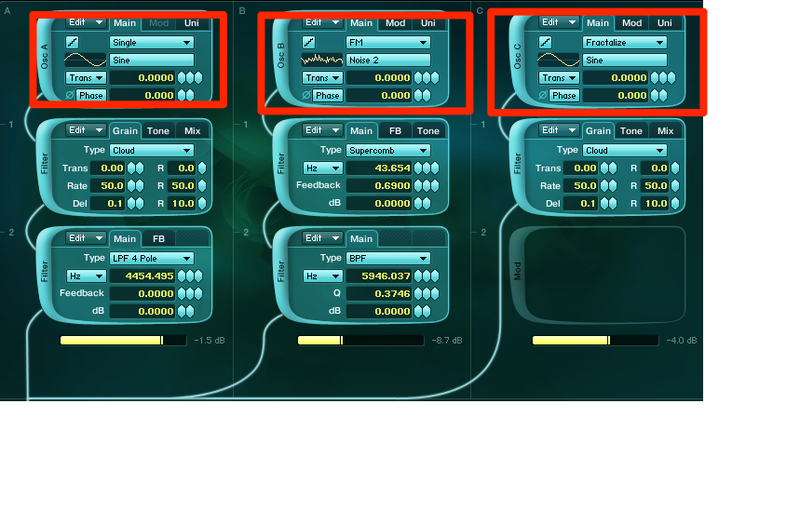 Almost all soft synths have a uniform way of generating sound, known as subtractive synthesis. An oscillator makes a sound (or noise), a filter removes frequencies from that sound, then the result is modulated (changed over time) in some way. For today, I will be focusing on recognizing the oscillator section of a soft synth. I have expanded the definition of oscillator to include anything that makes the sound. A synth using samples or physical modeling is not technically “oscillating,” but it still generates a sound and then filters and modulates, so it’s just easier to look at them all the same. The first way to locate an oscillator is to look for wave shapes. In the example below, I’ve put an orange box around the three oscillators of this Logic synth. 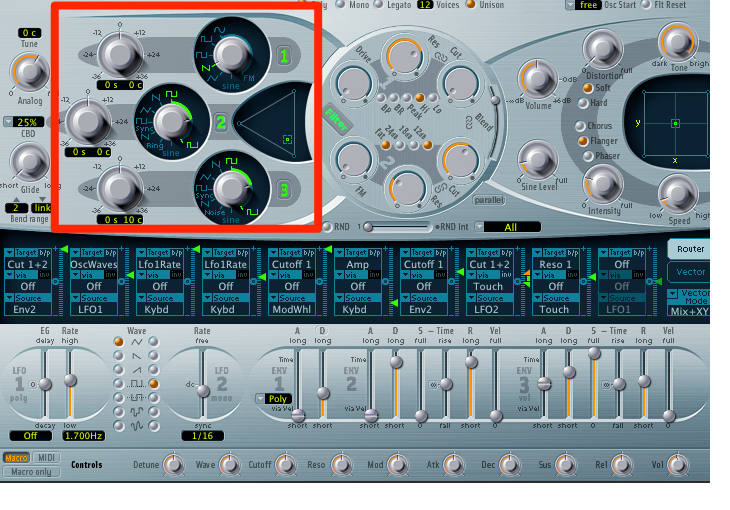 Notice the wave shapes that you can choose from by turning the dials. Sine waves, square waves, triangles, pulses, and sawtooth are very common. I would recommend trying them out to learn what they sound like. I can also make a video demonstrating the different sounds if anyone asks. While the layout can be quite different, the idea of having a thing generate the basic sound will always be there. 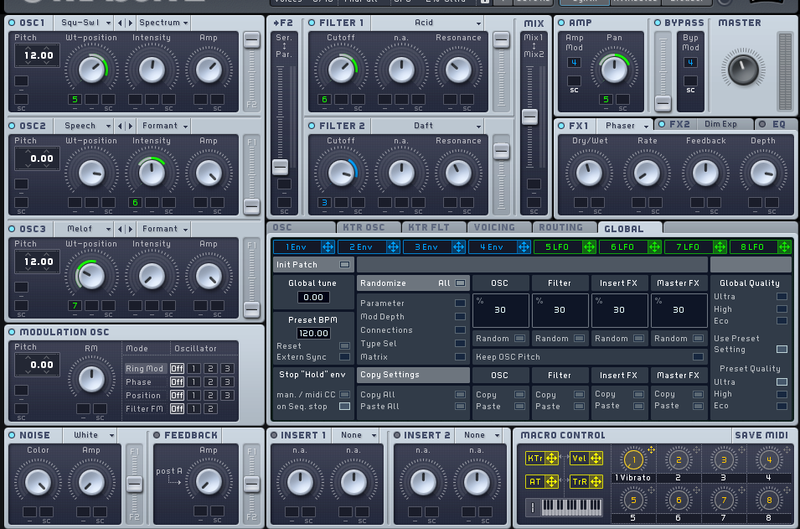 Here is what Absynth 5 looks like if you go to the Patch tab. 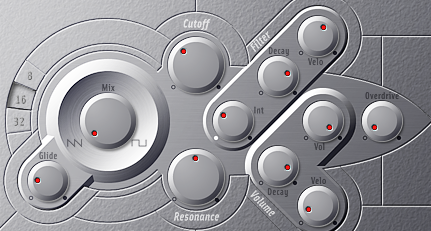 Instead of turning a dial, you choose waves from a drop down menu in Absynth, but the idea is still basically the same. My last example is a physical modeling synth from Logic, if you have trouble, try comparing this one to the Logic example above. So the homework is to try out some different sounds and learn what the character of each wave is. Next time we will look at the different types of filters and how they modify the sound from the oscillators. If you would like me to cover a specific soft synth or subject, feel free to leave a comment or send me a message. This entry was posted on December 23, 2012 at 9:59 pm and is filed under electronic music, lessons, music, music production, sound design with tags AAX, Ableton, Absynth, Analog, AU, digital music, electronic music, ES2, ESM, how to program sounds, Live, Logic Pro, Massive, music, music production, Native Instruments, Operator, production, programming, recording, Sculpture, sound design, synthesis, VST. You can follow any responses to this entry through the RSS 2.0 feed. You can leave a response, or trackback from your own site. As an old school vinyl DJ who is now using both vinyl and digital media, I really enjoyed this post. I’m currently trying to find time to make my own beats, but finding good tutorials has been a challenge since my free time is so restricted and some of the software’s learning curves seem to be a tad steep. Thanks for taking the time to post this and I’ll be looking forward to more. See you at Clash @ Karma next Friday! and now that I know someone is reading them, I will have to finish this section! be assured, it’s coming soon.